The Synthesis Technology E330 Multimode VCO is a low-cost digital oscillator with 3 unique operating modes: 2-operator FM, Morphing Wavetable or a 4-oscillator Cloud Generator (similar to the E340 module). The module provides 2 simultaneous outputs (OUT 1 and OUT 2), that change based on the MODE selected. Each output has an independent, corresponding modulation CV input and initial panel setting. The function of these 2 CVs varies based on the MODE. 2-OP FM is a 2 "operator" (to use Yamaha's terminology) FM (frequency modulation) where a sine VCO that is the 'pitch' (called the carrier) is FM'd by another sine VCO (the modulator). These sine VCOs are internally generated by the E330. OUT 1 has the pitched, FM'd result, and OUT 2 has the modulation sine wave. The MODULATION A panel/CV is the FM 'depth' or 'index' and varies from 0% (OUT A is a pure sine) to over 400% (4th harmonic overtones). 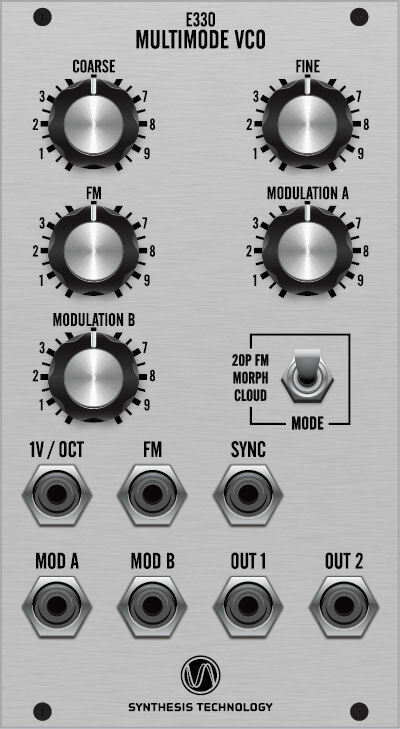 The MODULATION B panel/CV is a 64-entry look-up table that sets the ratio of the moduation VCO to the audio VCO. The modulator can be lower in frequency, the same frequency, or higher in frequency. The steps begin at 0 (no modulation) to 7.375 in steps of 0.125 For example a ratio of 2.000:1 means the modulator is exactly 2X the frequency of the audio VCO. The MORPH mode is a selection of 32 wavetables from the E350, which are continuously morphed (blended) in the 'Z Axis' (end-to-end), The wavetables vary from sines/harmonics, vocal effects, traditional shapes to noise. The 2 outputs have the same pitch (they share the 1V/OCT input and the FM CV) but have independent wavetables. MODULATION A/MOD A set the waveshape for OUT 1 and MODULATION B/MOD B set OUT 2. CLOUD mode is a variant of the E340 Cloud Generator, when set to the '4 Oscillator' setting. The E330 generates 4 VCOs, with OUT 1 being Sine and OUT 2 being Saw. The 4 VCOs are 'spread apart' (detuned) by MODULATION A/MOD A. This spreading is exponential, from slight beating (the 'Super-Saw effect') to a noise 'cluster'. In addition, filtered noise can be added to the spreading by MODULATION B/MOD B, which will add 'chaos' to the overall sound. The E330 Multimode VCO raises the bar for low-cost Euro VCOs, with dual outputs and 3 operating modes, all in a compact panel size.